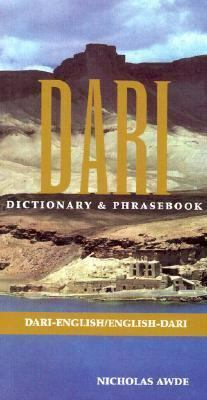 Dari is one of the official languages of Afghanistan along with Pashto. It shares a long literary history, both classical and modern, with the Persian (Farsi) of Iran, and the Tajik of Tajikistan, but over the centuries the languages have been split by politics and geography. Dan is written in a modified form of the Arabic script, but it has been transliterated here into the roman alphabet. This title contains a vast array of indispensable words supplying travellers and those working in Afghanistan with the resources needed to communicate effectively.Awde, Nicholas is the author of 'Dari Dari-English English-Dari Dictionary & Phrasebook' with ISBN 9780781809719 and ISBN 0781809711. Loading marketplace prices 6 copies from $2.74 How does the rental process work?